While the environment at some doctors’ offices may be described as sterile or clinical, the atmosphere at Ridgeview Chiropractic is warm, casual and peaceful. Dr. Todd and the staff are laid back and we like to keep things lighthearted and have fun. You’ll feel at ease from the moment you walk in. You’ll meet our front desk team and then spend some time with Wendy, our Patient Educator and Office Manager. She’ll warmly welcome you and take a detailed history of your problem and how it’s affecting you. You’ll learn what will happen during the first and second visits, so you will know what to expect. We’ll give you pamphlets to provide you with extra information so you can become even more knowledgeable about natural health care. You’ll then meet Dr. Todd for a detailed examination. He’ll discuss the information provided from the patient educator with you and based on his findings, determine if an adjustment or therapies are necessary to address your problem. Your first visit will take about an hour depending on the determination of the therapies. On your next visit, Wendy will meet with you and see how you responded to your first treatment. You will be given more chiropractic reading materials and together you will discuss your treatment plan. The plan will likely involve more visits during the first few weeks of care to get you the quickest results and to feeling better. Dr. Todd will then talk to you about what you can expect long term and discuss the results the report of findings from your first visit. We’ll answer any questions you may have about the information provided to you on your last visit. He will determine the best course of action and then move forward on the adjustment and therapies for your visit. 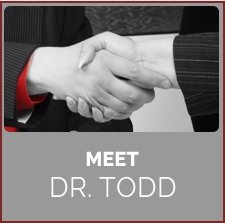 You’ll see Dr. Todd for your adjustment and any necessary therapies, such as the massage chair, electric muscle stimulation, or infrared therapy. Some patients prefer to sit in the massage chair for a while to enjoy a dose of relaxation. Most regular visits take just 10-15 minutes, but it depends on your particular treatment. Many patients tell us they’ve heard that they have to continue seeing a chiropractor for life once they start. You don’t have to, but you’ll probably choose to because of the remarkable results you’ll see. Your quality of life will improve and your pain will lessen. The medications you’re on may not be helping your condition and could be harming your liver or kidneys. We can restore your joint function with adjustments, and most of our patients make that choice to continue coming in for regular care. We want you to expect a great visit to our practice. Speak with us today to schedule your time!